Electric Valves are efficient valves that include actuators to help aid the progression of fluid in a system. 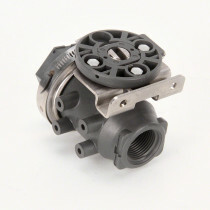 The valves available are produced by KZ Valve, Banjo, TeeJet, and Raven and are available in polypropylene, aluminum, or stainless steel construction. These electric valves are additionally available in bypass, butterfly, regulating, and ball valve models that are offered in a range of sizes and cycle times.